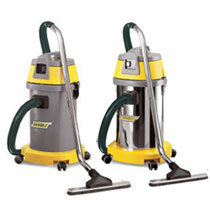 AUTO version is equipped only with special rubber crevice tool and 4 m hose Ø 40. 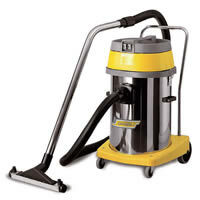 Medium size wet/dry vacuum cleaner. The IK version is equipped with stainless steel container and an antistatic device. Additional nylon filter in standard delivery, HEPA cartridge filter and paper filter bag are available as an optional. The PD version is equipped with a drain hose to empty the container (liquids). Two motors separately switchable. AUTO version is equipped only with special rubber crevice tool and 4 m hose Ø 40. 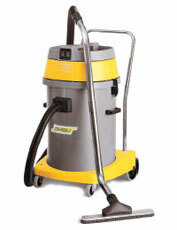 Great capacity and powerful wet/dry vacuum cleaner with chassis equipped with wheels/castors. The IK version is equipped with stainless steel container and an antistatic device. Two motors separately switchable. The CBN version is equipped with container with tilting and locking system. Driving frame in anti-shock plastic material. Available in option cartridge filters M and HEPA class. 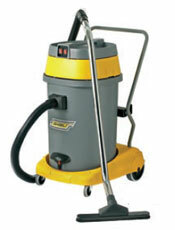 Wet/dry vacuum cleaner with chassis equipped with wheels/castors; great capacity. The AS 590 IK CBM version is equipped with stainless steel container and anantistatic device. Two motors separately switchable. The CBM version is equipped with container with tilting and locking system. New, robust metal trolley. Paper filter bag with cap, nylon filter and spacer for plastic bag (optional). Standard and HEPA cartridge filter (optional). 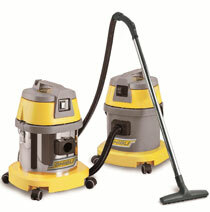 High performance wet/dry vacuum cleaner. Three motors separately or simultaneously switchable. Nylon filter and spacer for plastic bag (optional). Standard and HEPA cartridge filter (optional). 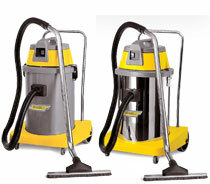 High performance wet/dry vacuum cleaner, with driving frame and stainless steel container. Equipped with an antistatic-kit. Three motors separately or simultaneously switchable. Nylon filter and spacer for plastic bag (optional). Standard and HEPA cartridge filter (optional). 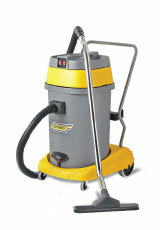 AUTO version is equipped only with special rubber crevice tool and 4 m hose Ø 40. 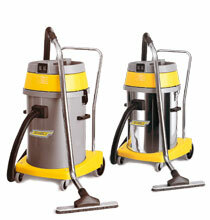 High performance wet/dry vacuum cleaner, with driving frame. Three motors separately or simultaneously switchable. CBN: container with tilting and locking system. Nylon filter and spacer for plastic bag (optional). Standard and HEPA cartridge filter (optional). 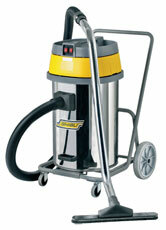 High performance wet/dry vacuum cleaner. Three motors separately or simultaneously switchable. The IK CBN and IK CBM versions are equipped with stainless steel container with tilting and locking system, an antistatic device and gives the possibility to use Ø 90 accessories. The IK CBM version is equipped with new, robust metal trolley. Nylon filter and spacer for plastic bag (optional). Standard and HEPA cartridge filter (optional).